Mmmm.. Smoky Portobello Black Bean Burgers. Just typing those words makes me drool a little bit. This was my first time making my own veggie burgers, so I wanted them to really stand out. As part of our Kickstarter recipe set, this Smoky Portobello Black Bean Burger was made for someone special, our good friend and burger aficionado. This is the type of guy who will spend literally all day in the kitchen crafting three different types of handmade burger patties, each with their own sauce, to throw on the grill in the evening. I had to create a vegan burger that was hearty and flavorful enough to be a regular on our friend’s plate. I paired a smoky black bean patty with juicy, marinated portobello mushrooms caps, caramelized onions, and roasted garlic aioli. I definitely recommend roasting the garlic the night before (maybe alongside a pan of our Popcorn Roasted Rainbow Carrots!) It speeds up the process a lot. The most flavorful vegan burger EVER. Smoky black bean patties topped with marinated portobello caps. Finished with roasted garlic aioli and caramelized onions. So much YUM. 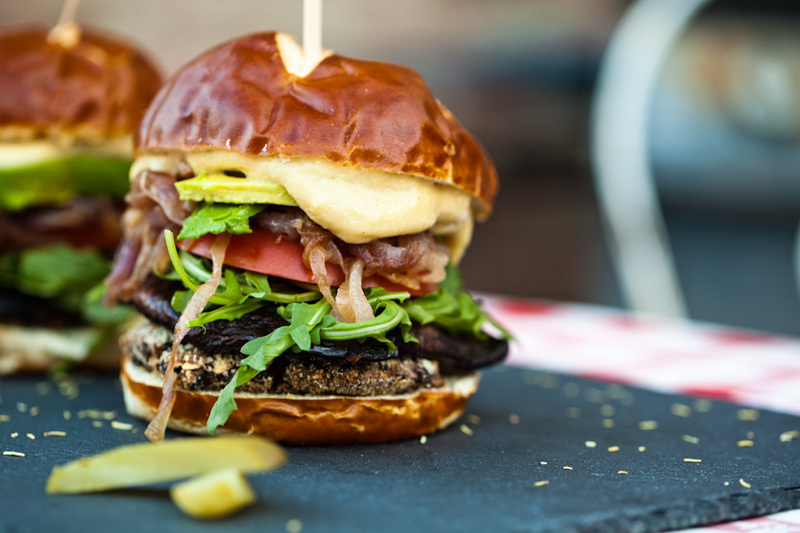 6 vegan burger buns we love pretzel buns! In a medium bowl, mash the black beans until they are about half mashed, half whole. Stir in the liquid smoke and spices. Mix well. Add the oats and mix with your hands until evenly combined. Divide the black bean mixture into six even balls, then shape the balls into patties. Pour the bread crumbs into a shallow dish and evenly coat each black bean patty in bread crumbs. Place in the freezer for twenty minutes to firm up. Meanwhile, combine the garlic, soy sauce, balsamic vinegar, and olive oil in a small bowl. Stir well. Place the portobello mushroom caps in two oiled baking pans. Pour the balsamic soy marinade over the portobellos, evenly distributing the marinade between the 6 caps. Set aside for 15 minutes and preheat the oven to 350. Heat 1 tablespoon olive oil over medium heat. Add the red onion and stir well. Cook for 1-2 minutes, then cover and reduce heat to low. Allow the onions to caramelize over low heat for up to 30 minutes, stirring occasionally. Prepare your Roasted Garlic Aioli. Remove the black bean patties from the freezer and heat the remaining tablespoon of grapeseed oil in a large skillet on medium high heat. Cook each side of the black bean patties until golden brown, about 1-2 minutes. Place the black bean patties on a baking sheet. Bake the black bean patties and marinated portobellos at 350 for 25 minutes. Spread a generous amount of Roasted Garlic Aioli on each side of a vegan bun. Build your Portobello Black Bean Burger with a black bean patty, marinated portobello cap, caramelized onion, and whatever other toppings you desire. We used beefsteak tomato, wild arugula, and avocado. Enjoy! Preheat the oven to 350. Trim the ends of the heads of garlic, being sure to cut the tip off every clove. Drizzle 1/2 teaspoon grapeseed oil on the ends of each head of garlic. Wrap the garlic in foil and bake for 40 minutes. This is recommended to be done the night before. Meanwhile, soak the cashews in water for 2 hours or overnight. Drain. When the roasted garlic is cool enough to handle, squeeze each clove out into the jar of a blender. Add the soaked cashews, nutritional yeast, lemon juices, salt, pepper, and tapicoa flour if using. Blend until smooth, roughly 2-3 minutes. Slowly add the water as the sauce is blending until your desired consistency is reached. Blend for an additional minute or two until the sauce is extra smooth. *Roasted Garlic Aioli will keep in a covered container in the fridge for 3-5 days. If you loved our Portobello Black Bean Burger, giant sandwiches, and smoky flavors, check out this BBQ Pulled Jackfruit Sandwich or our Mac Daddy Vegan Breakfast Sandwich! Mouth watering photos! I love portobello in burgers. How many grams of cooked beans is that, if we don’t use canned ones? One can of black beans is equal to about 1 1/2 cups which I think comes out to roughly 375 grams (ish).